Pictures of their work reminded me of a lunchtime conversation that sprang up among Legionnaires admiring the array of regimental and association shields displayed across the breadth of Le Tommy Bar in Poziéres, following the SA Legion Somme Remembrance Ceremony at Thiepval in July. 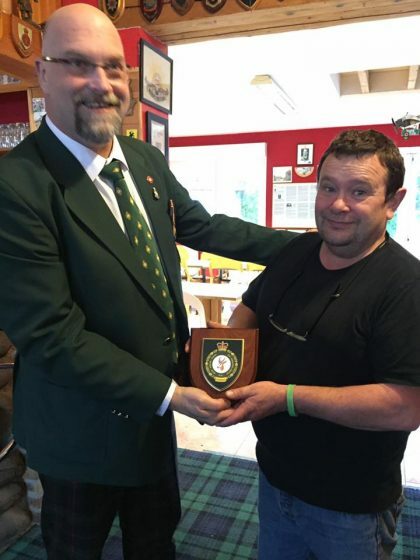 Andrew Bergman hands Dominique, owner of Le Tommy Bar in Pozieres his shield. The company offered to make a free preview mock-up if supplied with good artwork. 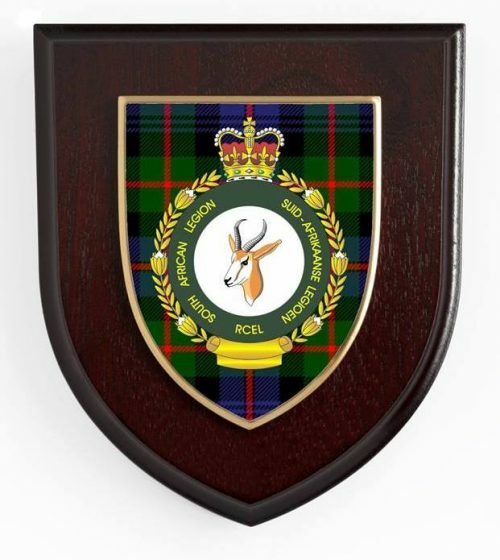 I sent them a digital version of the Legion badge, and asked for two design options: one with a dark green background to mimic our green blazers, and another backed by the Murray of Atholl (modern) tartan. I was immediately impressed by the professionalism of their service, and received the designs a few days later. The Committee were unanimously divided when they saw them. “Both look great” was the consensus, so we resolved to approve both designs, with a preference for the medium mahogany backing shield. There was also the option to emboss the shield, which needed a once-off die to be made, but the added cost would prove more than worth it. The first order was placed in the nick of time to ensure delivery by our Branch AGM in London following the Cenotaph Parade on Remembrance Sunday. They were delivered to our Chairman’s home in Oxfordshire, and his reaction was so positive, I motored through from North London to collect them. Some were to be collected personally at the AGM, while others would be sent-off by mail. Well, Rowan Displays certainly did us proud. They are of super quality, and can be displayed with pride in any office, mess, bar, or man cave. 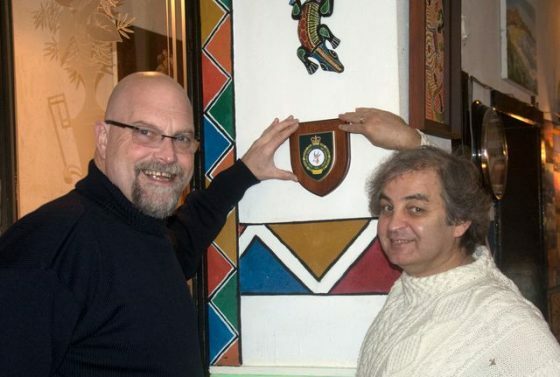 Andrew Bergamn assists Michael Ricketts, proprietor of Café Restaurant Tjing Tjing in Amsterdam, places an SA Legion Shield among his eclectic collection of South African memorabilia. Tjing Tjing is a favourite hang-out for SA expats, visiting Afrikaans musicians, and Amsterdammers with an affinity for South Africa. The week after the AGM, Peter & Karen Dickens, and my wife Johanna and I travelled to Thiepval for the ceremony organised by the Royal British Legion to mark to mark the end of the Battle of the Somme. 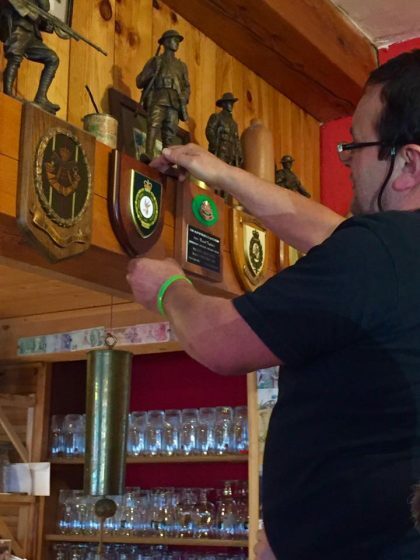 Afterwards, we thawed our fingers and toes at Le Tommy Bar, where a South African Legion Shield now rubs shoulders with shields placed by regiments and associations from around the world. And it stands out! 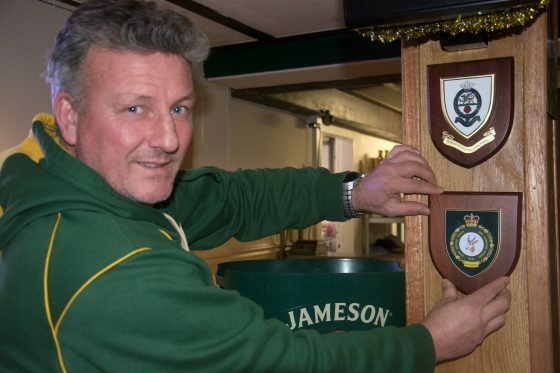 Dominique, owner of Le Tommy Bar in Pozieres proudly hangs his shield. Peter & Karen later presented one to the curator of the Delville Wood Museum. 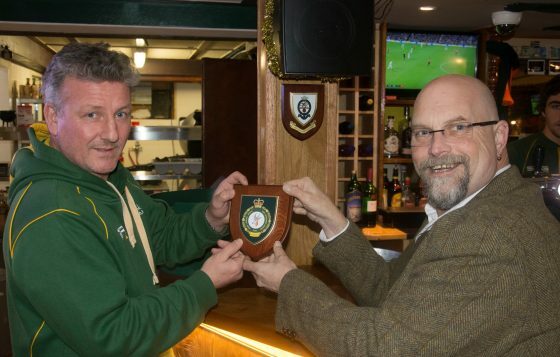 Shields have subsequently been placed in the Springbok Bar in The Hague, as well as Tjing Tjing South African restaurant in Amsterdam, both favourite meeting places for Saffas in Polderland. 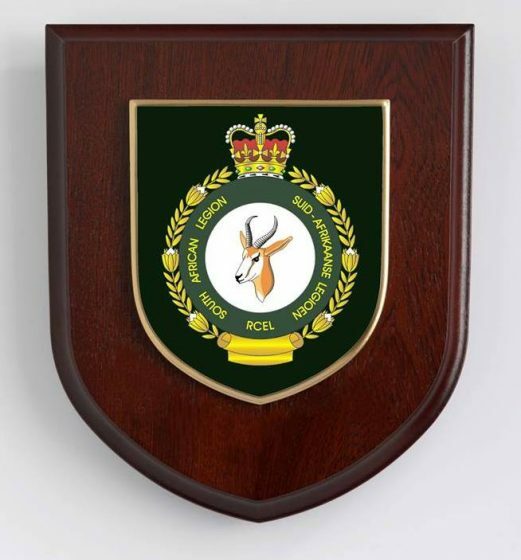 The next batch of SA Legion Shields will be ordered soon. They are available to members only. We need to order 25 units to get the best price, so please email Andrew Bergman and let me know if you are interested in a dark green or tartan one. The price will be around £30 (including postage to a UK address). 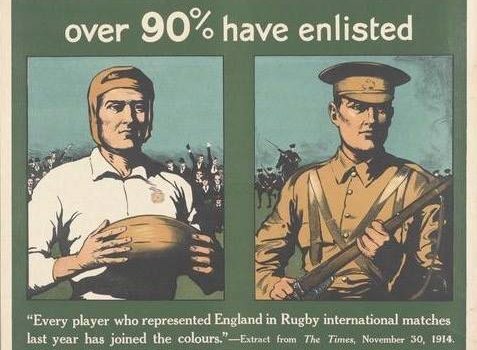 Article by Andrew Bergman for the SA Legion UK & Europe. The Second Battle of El Alamein. On this day in 1942. 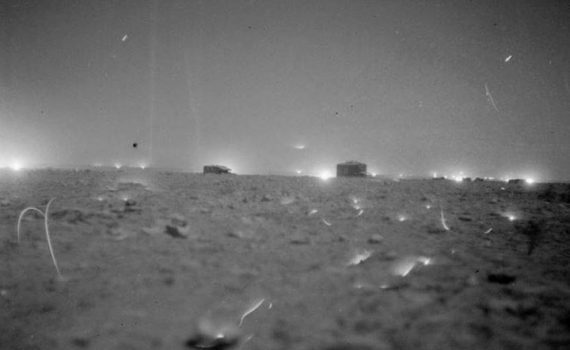 The Second Battle of El Alamein begins and this is how it looked from the start line for British, South African and other Commonwealth troops taking part in the battle – this image taken as the British night artillery barrage opened the battle on 23 October 1942. 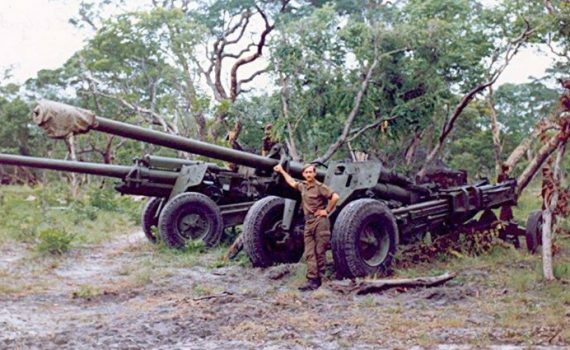 Bush War in Angola, now here we have a serious piece of captured Soviet artillery, taken by the SADF during Ops Hooper in 1988. One can only appreciate the size of this weapon when one stands next to it. The hardware in question is the Soviet manufactured 130mm M-46 Artillery Towed Gun is manually loaded and was used in the Soviet Army since the 1950s. The M-46 was first seen in public in May 1954 and originally was known in the West as the M1954. Operation of the M-46 towed gun revolves around a crew of eight personnel. The M-46 is no longer in service with the Soviet Army but is still used by many armies in the world, mostly in Africa, Asia and the Middle East. The M-46 has a barrel with a tied jaw horizontal sliding block breach with a ‘pepperpot’ muzzlebrake. The M-46 was developed from the M-36 130 mm naval gun used on ships and for coast defence. Ammunition included High Explosive Fragmentation, Armour Piercing Solid Shot, Smoke, Illuminating and Chemical shells. The High Explosive shells weigh some 33 kg. The maximum rate of fire for this gun is between 5 and 6 rounds per minute and about 70 rounds per hour over a maximum distance of 27,1km. The barrel is mounted on a split-trail carriage, with deep box section trails and foam filled road wheels on the ground when firing and 50° (25º left and 25º right) of top traverse. The barrel can elevate from -2.5 degrees up to +45 degrees. The carriage is of the split trail type and is provided with a two-wheeled limber. The small armoured shield protects little more than the sights from the effects of muzzle blast and also provides a limited amount of protection from machine gun fire in anti-tank engagements. The gun has long and robust trails to provide stability when firing and a large detachable spade is fitted to the end of each when the gun is brought into action. The gun is mounted on a two-wheeled split trail carriage with large sponge-filled rubber tires on each of the single wheels. For travel, it is provided with a two-wheeled limber and can be towed by a truck or armoured vehicle. The length of the gun is 5,4m, width is 2,2m and height is 1,8m. When travelling, the 130 mm barrel is withdrawn by a mechanism onto the right trail from battery to the rear to reduce the overall length of the weapon which can be safely towed by truck at a maximum speed of 50 km/h. The weapon weighs 8 450kg in the traveling position and 7 700kg in the firing position. The M-46 towed gun has the OP4M-35 direct fire sight with a field of view of 11º and a magnification of ×5.5, as well as an APN-3 active/passive night sight. The M-46 fires case-type, variable-charge, separate loading ammunition. Photo and caption thanks and courtesy to Graham Du Toit. 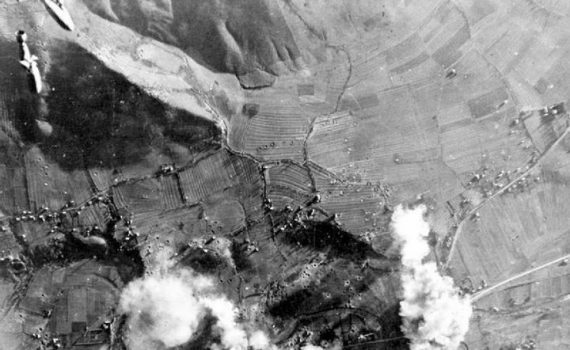 A South African Air Force 34 Squadron Liberator bomber’s stick of bombs (top left hand corner) on their way down onto the Marshaling Yards at Sarajevo, Yugoslavia during a 2 SAAF Wing Raid on the facility. In case you are wondering why Angola is one of the most mined countries in the world, well this captured Soviet hardware goes some way to explain how mining land mines on an industrial level can be done. Here we have the Soviet manufactured PMZ-4 Minelayer Trailer. Originally designated the PMR-3 “Pricepnoi Minnyi Raskladchik” meaning “towed mine layer (surface)”, this apparatus was the first Soviet minelayer capable of burying mines as well as laying them on top of the ground. It consists of a single chute and a plow attachment. The attachment provides the option of burying the mines or depositing them on the surface of the ground. 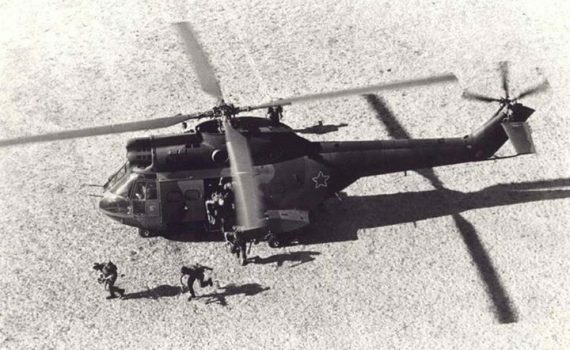 The PMR-3 equipment designation was later changed to PMZ-4 “Pricepnoi Minnyi Zagraditel” meaning “towed mine layer (buried)” as this designation was more accurate in describing the task carried out by this piece of equipment. The type of mines laid by this apparatus were the Soviet TM-44, TM-46, TM-57 or TM-62 series anti-tank mines. The mines could be spaced 4 to 5,5m apart depending on the control setting. If buried, the mines are placed at a depth between 6-12 cm while the vehicle traveled along at a speed of 5km/h. The trailer on its own weighed 1.8 metric tons. 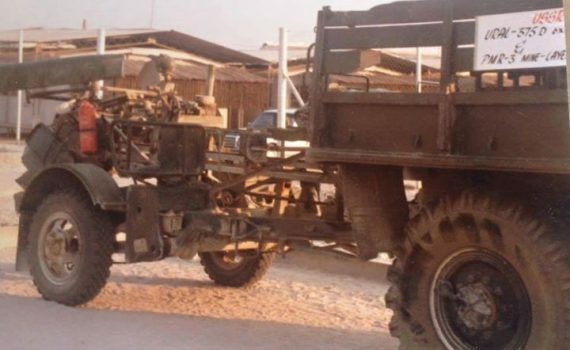 The towing vehicle could carry 120 to 300 mines depending on the capacity and type of vehicle. The SADF captured one of these trailers in Southern Angola during Ops Protea in 1981. The captured PMZ-4 minelayer trailer is seen pictured here while on display to the public at Oshakati. A little snippet of relatively unknown South African history. Here’s another South African military veteran from the Second World War who went on to become a famous movie star. 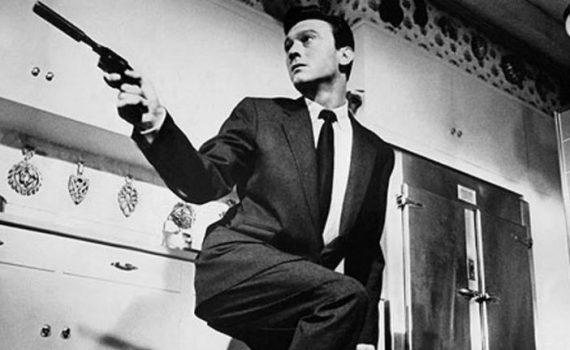 Laurence Harvey (born Laruschka Mischa Skikne; 1 October 1928 – 25 November 1973) was a Lithuanian-born South African actor. In a career that spanned a quarter of a century, Harvey appeared in stage, film and television productions primarily in the United Kingdom and the United States. His performance in Room at the Top (1959) resulted in an Academy Award nomination. That success was followed by the role of the ill-fated Texan commander William Barret Travis in The Alamo (1960), produced by John Wayne, and as the brainwashed Raymond Shaw in The Manchurian Candidate (1962). Harvey’s civil birth name was Laruschka Mischa Skikne. His Hebrew names were Zvi Mosheh. He was born in Joniškis, Lithuania, the youngest of three sons of Ella (née Zotnickaita) and Ber Skikne, Lithuanian Jewish parents. When he was five years old, his family emigrated to South Africa, where he was known as Harry Skikne. 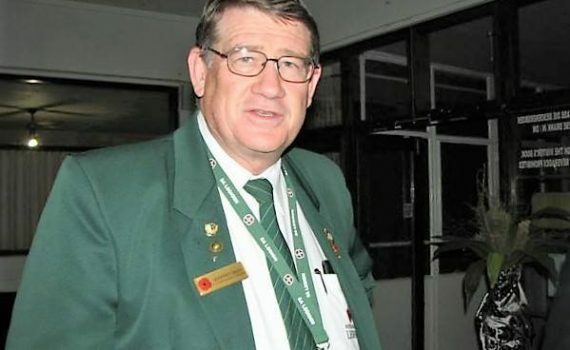 He grew up in Johannesburg, and was in his teens when he served with the entertainment unit of the South African Army during the Second World War. This is not the time to play games! Another South African Air Force artwork by renowned aviation artist Derrick Dickens’, part of his collection of South African Air Force paintings. 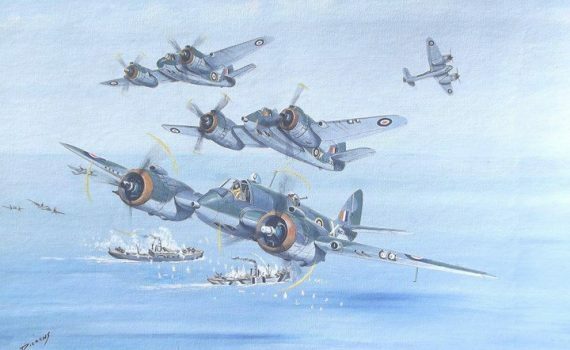 These are SAAF Beaufighters attacking German ships during World War 2. Acrylic on canvass. Derrick passed away recently and is sorely missed by family, friends and the SAAF community.